God has blessed us beyond measure with His grace, and He Himself has made us worthy and accepted by Him. When it comes to living in this grace, rather than asking God to "bless our efforts," we trust instead that God does it all (it's His work that He does in us) and He willingly and gladly invites us to come along with Him and take part in what He's doing! Knowing that God's grace is completely underserved by us, and that we can't do anything to make ourselves worthy of it, really does bring about a sense of restful humility. Do you guys have any teaching on the covenant? I know that it is not up to us to keep our side because that goes against-Hebrews 8:9. Is there any scripture that points to the covenant being between God and Jesus? I believe it to be true, I just want any scripture references. Continue to spread the good news! Hi Mike. There is so much to say about this but I can only give you a few thoughts to save space & time. But it's a good topic for future discussion on our podcast. This new covenant is a blood covenant. Obviously we know who shed (spent) the blood to bring redemption to mankind. It was Jesus. 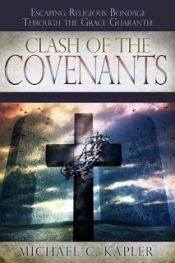 If the new covenant had been an agreement between us and God rather than the Father and the Son, we would all be doomed. He is the mediator of this new & better covenant (Hebrews 9:15). A mediator is defined in the Greek as "one who intervenes between two, either in order to make or restore peace and friendship, or form a compact, or for ratifying a covenant. (see also Galatians 3:15-20). Christ was the second Adam (Rom. 5:12-19). Therefore, He stood in Adam's place to be the covenantal head and representative of the human race. In Luke 22:29 Jesus says, ". . . I appoint unto you a kingdom, as My Father hath appointed unto Me. The verb "appointed" means to appoint by will or covenant. This is covenantal language. The covenant of this blood of Christ is an eternal covenant (it has always existed and will always exist)...Hebrews 13:20. Christ was appointed to the office of Redeemer from the foundation of the world (Rev. 13:8). The covenant of redemption was set up from eternity (Rom. 16:25). Although the covenant was made from eternity, it could not be ratified and sealed until Christ had fulfilled all that He covenanted to do. When he cried, "It is finished!" He addressed His Father. The compact was now fully accomplished (completed). Hebrews 9:16-17: "For where there is a testament, there must also of necessity be the death of the testator. 17 For a testament is in force after men are dead, since it has no power at all while the testator lives." Testament here referring to covenant and the testator (Jesus) is "the one who enters into agreement, covenant with one." So this thing we call the new covenant is not really new at all except in light of the fact that it would replace the first covenant made with the Jewish people. Time and time again divine wrath was suspended only because it was put to the account of Jesus Christ, who in due time would pay all previous covenant debts. Perfection was required to fulfill the covenant. That perfection was found in Christ and we are the heirs and beneficiaries. That's a good question, Mike, and as I think about it I'm not sure that the Bible puts it in those words (although I could be wrong), but yet the concept or understanding of the covenant being between God and Jesus is there in many places. The main thing is that it wasn't a covenant that was depending upon man to keep it, or else it would be just as "weak" and "unprofitable" (Heb 7:18) as the first covenant was. Here are some passages that talk about the nature of the New Covenant. 17 And this I say, that the law, which was four hundred and thirty years later, cannot annul the covenant that was confirmed before by God in Christ, that it should make the promise of no effect. 18 For if the inheritance is of the law, it is no longer of promise; but God gave it to Abraham by promise. 13 For when God made a promise to Abraham, because He could swear by no one greater, He swore by Himself, 14 saying, "Surely blessing I will bless you, and multiplying I will multiply you." 15 And so, after he had patiently endured, he obtained the promise. 16 For men indeed swear by the greater, and an oath for confirmation is for them an end of all dispute. 17 Thus God, determining to show more abundantly to the heirs of promise the immutability of His counsel, confirmed it by an oath, 18 that by two immutable things, in which it is impossible for God to lie, we might have strong consolation, who have fled for refuge to lay hold of the hope set before us. 16 For where there is a testament, there must also of necessity be the death of the testator. 17 For a testament is in force after men are dead, since it has no power at all while the testator lives. 18 Therefore not even the first covenant was dedicated without blood. Again, these verses don't say the specific words that the covenant was between God and Jesus, but they make it clear that it was all about God's promise and Jesus' blood, having nothing to do with man's attempt at keeping a covenant. I hope this gets to what you're getting at, and I'm sure there are more passages that address all of this as well. As far as teachings on the covenants, about a year and a half ago we did an 8 part series called "Covenant Confusion" that might be of interest. I'm linking here to Part 1, and the rest of them can be found by clicking "Newer Post" at the bottom left part of each post. I will be hearing the Covenant Confusion to get a better understanding.